Wondering why you’re not getting the results you expected from LinkedIn? Maybe you should take a closer look at your profile. LinkedIn was launched in 2003 and is currently the third most popular social network in terms of unique monthly visitors—right behind Facebook and Twitter. LinkedIn is the world’s largest online professional network, with more than 400 million members in over 200 countries and territories. More than half of business-to-business (or B2B) companies are finding customers through LinkedIn. With this tool, you now have the opportunity to engage with your connections, as well as with your connections’ connections (your second-degree network), and even with their connections (your third-degree network). But before you can do this, you need to know how to make the most of your LinkedIn account. How do you do this? Well, before creating or editing your profile, write down three main keywords. Choose phrases for which your target market will search. What would your clients type into Google to find your products or services? Your primary keyword (e.g., Greek software translator) should appear in most sections of your profile. Location and Industry: Under your headline, add your location and the industry in which you work. Most translators choose “translation and localization,” but in some cases you can choose other fields. For example, if you only specialize in a specific field (e.g., software), you can choose that industry instead. Current/Previous Experience: It’s also important to list your current position and any previous jobs you want to emphasize in the section directly under your headline. (You can provide more details on these when you get to the summary section.) The keywords you have researched and added in the sections for job titles, companies for which you’ve worked, and job descriptions are indexed and help you appear higher in LinkedIn and Google searches. Make sure to include all of your relevant previous positions (up to three are visible). Contact Information: Make sure to add your website, blog, and social media accounts along with your contact details. Make sure to customize the titles of the links so they are not generic (e.g., don’t type something like “personal website”). Also, customize the URL of your LinkedIn profile. Instead of a string of numbers next to your name, the URL should include just your name. Connecting your LinkedIn profile to your name will allow you to be found easier by connections. Aside from the headline, the summary is the second most important part of your LinkedIn profile. Your summary is not your bio; it’s your elevator speech, your 30-second commercial. It should tell people why they should do business with you today. It’s the main marketing message of your LinkedIn profile, since it provides potential clients with a quick overview of who you are, what you are looking for in a job, and most importantly, what you can do for them. The services you provide and the problems you solve. Your expertise, your major accomplishments, and the most important highlights from your work experience. A description of your ideal clients. This means the people who would benefit from working with you (your target audience). A description of your unique selling proposition (USP), which is what makes your services different and better than other linguists with the same languages and specializations. A call to action so the readers know what to do after they read your profile. Experience: This section includes your current and previous job positions, along with a description of each. Write with your audience in mind and include all the bells and whistles that highlight your experience. You can include media files (e.g., links, videos, slides) for each position to showcase a sample of your translation work, a presentation you gave, a client testimonial, and so on. Endorsements and Recommendations: Other sections that you should manage in your profile are endorsements and recommendations. You can rearrange the order of the endorsements so that your more important ones are on top (e.g., translation and localization). If someone endorses you for a service you don’t provide, you can remove that skill. As for the recommendations, you can politely ask your clients to provide them at the end of a successful project. On LinkedIn, the optimal sharing frequency is one to two updates per day, not including any comments you add in your LinkedIn Groups or in other people’s updates. Try to maintain the 80–20 rule. This means that in 80% of your updates, talk about the things that matter to your contacts and customers and share content they might find useful, and in the other 20% talk about yourself. You can share an interesting article with a comment or question to engage your followers in conversation. You should also take the time to read, like, and comment on your connections’ updates. A great way to share content is through LinkedIn’s Pulse blogging platform. By using Pulse (in addition to your own blog, if you have one), you have the opportunity to reach a new audience that may not have visited your website before. These posts are searchable and will show up in Google’s search results, thus helping to boost your personal brand. Pulse posts are displayed on your profile and your first-degree connections receive a notification each time you post a new article. If your connections interact with your post in any way (i.e., like, comment, or share), it will become visible to their first-degree connections as well, thus expanding your reach to your second-degree network and beyond. LinkedIn currently has more than one million groups, and you can join up to 100 of them. When you are part of a group, you’ll receive regular e-mail notifications about group discussions. You can manage the notification settings for a particular group and decide whether or not you want to have the group logo appear on your profile. LinkedIn Groups provide several exceptional marketing opportunities that you can take advantage of. By engaging in the discussions your group members have and answering questions, you become a resource. By posting valuable, industry-centric content that is helpful to your current and potential customers, you’ll develop a community of advocates who connect to your message and brand. You should use your groups strategically to find prospects. Join the ones where your customers are members to find potential leads, and also join a few groups in your industry to keep up with the latest discussions and news. The group functions allow for searching, viewing, and contacting group members, as well as posting discussions, promotions, and job opportunities. To decide if a group is worth following, you can visit its homepage where you will see a description, the number of group members, who the admins are, and if any of your connections are members of that group. LinkedIn Groups offer a few more perks from which you can benefit. For example, if you’re a member of the same group as another user, you can bypass the requirement to be a first-degree connection and message them directly. LinkedIn allows you to send up to 15 free direct messages to fellow group members per month (across all groups to which you belong). In addition, group members are able to view the profiles of other members of the same group without being connected. AND: For results that include two or more terms (e.g., manager AND director). OR: For results that include just one of two or more terms (e.g., sales OR marketing). NOT: If you want to exclude a particular term, type that term with an uppercase NOT immediately before it (e.g., NOT computer). Quoted searches work the same as in Google searches. If you’re looking for an exact phrase, enclose the phrase in quotation marks (e.g., “product manager”). To do a complex search, you can combine terms using parentheses. For example, “software AND (engineer OR developer)” will show both software engineers and software developers in the results. A great feature of LinkedIn Advanced Search is that once you’ve developed these complex searches, you can save them. You can also ask LinkedIn to send you weekly or daily notifications of the new people who meet your search criteria. With the free LinkedIn account, you can have up to three saved searches. There are many different places to look for potential prospects and connections. LinkedIn is essentially an enormous database. The success you have with finding new contacts and prospects will depend on your ability to truly understand your target market and manipulate the search filters LinkedIn provides. When you find interesting people with whom you want to contact or add in your network, you can message them (for free through a common group, if any) or invite them to connect. 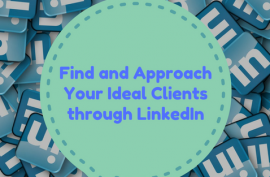 Unless the user with whom you would like to establish a connection is a friend or colleague, you should always personalize your invitations to connect with LinkedIn users, especially potential clients. Always start by addressing the contact by his or her first name, so it’s clear that the message is not a mass invite to your entire e-mail contact list. Then mention how you know them. You might have come across their profile due to something they wrote, shared, or were quoted in. Make sure to call out the specific piece of content that perked your interest. Add a genuine and specific reaction to their article, blog post, or discussion. Keep the conversation going by sharing a post or article of your own, or you can also make a recommendation about a book, group, or blog. Finish your invitation with a request to join their network and sign your name. LinkedIn allows 300 characters (including spaces and paragraph returns). You can’t include e-mail addresses and website links in invitations to connect. LinkedIn’s built-in CRM features give you the ability to manage your connections using the features Tags, Reminders, Notes, How You Met, and Who Introduced You. These are particularly useful for supporting your prospecting and networking efforts on LinkedIn and allow you to keep track of key prospects and clients easily. Every time you reach out and connect with a contact or when someone reaches out to you, get into the habit of updating the Relationship tab (underneath the header section of your contact’s profile). You can also “tag” your contact, which allows you to segment your connections into “labeled groups” that are very useful for prospecting. You can have up to 200 tags on LinkedIn. You can find your tagged connections easily later by going to the Connections page and filtering your connections by tag name. This information isn’t visible to your connections; it’s your very own digital Rolodex. You have access to more specifics on who has viewed your profile. With the free account you can see only the last five people, whereas having a paid account allows you to see all the people that viewed your profile within the past 90 days. You have more filters available in the Advanced Search. You have more saved searches than the three available with the free account. Social prospecting and marketing is not a numbers game. Sometimes new translators fresh out of college think that they can increase their chances of getting work by sending out a large number of CVs or by connecting to lots of people on social media. I think freelancers and small companies are in the unique position to choose and research carefully the people and companies with whom they want to work. Spend the time and go the extra mile to increase the response rate of your leads many times over. Each marketing strategy has a different purpose, so develop a process for your approach. 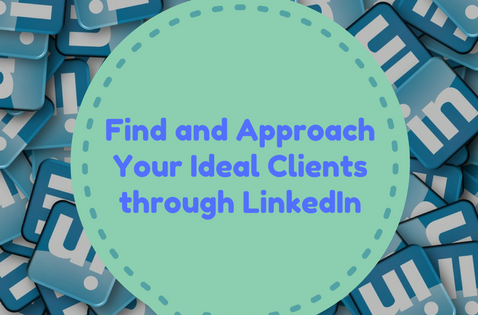 LinkedIn is a great tool to identify and research potential clients and to make the first contact. Mention who you are, why you are reaching out, show what you have to offer (through your well-crafted profile), and why it’s worth responding. Never go for the sale in that first message or invitation, since this can put people off. When the potential client turns into a contact, then you can send the “warm” e-mail and talk about how you can help them. This article was originally published in The ATA Chronicle, the monthly magazine of the American Translators Association (www.atanet.org).